“Being a huge lover of all things Christmas, I wanted to create a styled shoot inspired by this holiday but stepping out of the traditional theme we often see – red & green, snowflakes and Santa. Instead, with the help of an incredible team of vendors, my vision of “Urban Christmas” was brought to life at one of the best restaurants in the city of Edmonton. Focusing on keeping the shoot modern yet reflective of a traditional Christmas, we kept the vibe moody & cozy, embodying the feel that Christmas brings. Combining a ton of evergreens with lush flowers and copper metallic accents throughout the shoot captured the essence of the theme. Modern hand-made shapes called Himmeli, which are a traditional Finnish Christmas ornament, were brought into nearly every aspect of the design – flower centrepiece runner, the bride’s gorgeous hairpiece, the groom’s boutonniere, the cake topper and of course as tree ornaments. The Himmeli shape even inspired our stationery design. 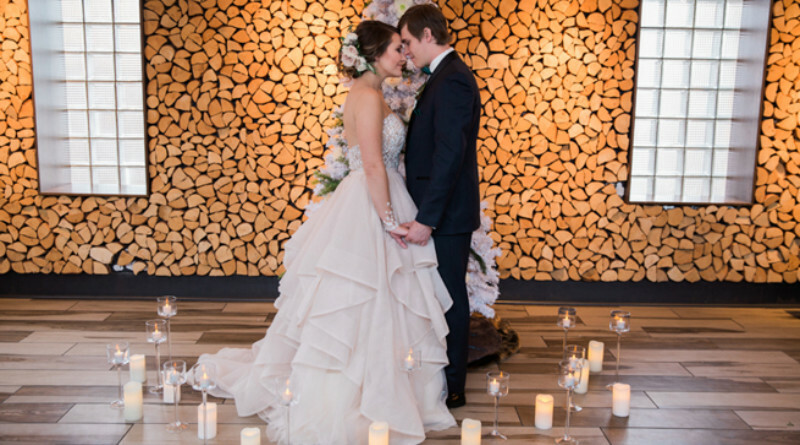 Graced by an incredible two-piece gown, our bride was glowing as she stood hand-in-hand with her groom in front of the Christmas tree, making promises of love & happiness to one-another. We had the best time creating this shoot and hope that it helps to inspire couples who want a Christmas wedding that is slightly less predictable in design.” – Sandra Bettina Weddings and Events.